Over the years my family has eaten a lot of potatoes. Mostly because we like them and they are filling. Partly because potatoes – even organic ones – are inexpensive. And there are so many varieties and colors. Have you tried purple fingerling potatoes? They are a mouthful of awesome roasted in the oven with olive oil and good salt . You know what else is a mouthful of awesome? Potato puffs. 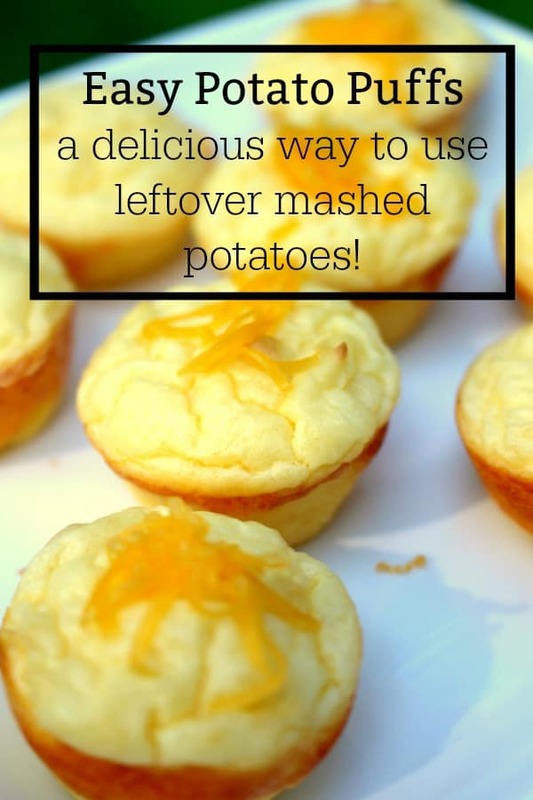 They are super tasty and are a wonderful way to use leftovers. I occasionally make too many mashed potatoes. These potato puffs are a great way to use leftover mashed potatoes for a completely new and delicious dish. Potato puffs are versatile and super frugal. They make great appetizers or a quick dinner and they’re especially yummy for breakfast on the go. I made them for an on-the-go dinner one night and then had a couple the next morning for breakfast. I thought they tasted even better the next morning. How much fun would it be to make potato puffs from different color potatoes? I think I’ll make potato puffs with purple potatoes next. I hope your family enjoys this fun and frugal recipe as much as mine does! 3. In a large bowl, combine all of the ingredients with a mixer. 4. Spoon or pipe mixture into mini muffin cups. 5. Bake for 16 minutes or until lightly golden and puffed. 6. Remove from pan by sliding a spoon beneath each puff to lift. 8 cups of mashed potatoes I used 3 jumbo baking potatoes. In a large bowl, combine all of the ingredients with a mixer. Spoon or pipe mixture into mini muffin cups. Bake for 16 minutes or until lightly golden and puffed. Remove from pan by sliding a spoon beneath each puff to lift.